Here's where the 101st Airborne Division and the 10th Armored Division held out for five days against the far heavier German forces and rejected the Nazi surrender ultimatum with a fine, peremptory "Nuts!" Bastogne was a town of 5,000 people before it was threatened by von Rundstedt's Ardennes offensive. Then 4,000 were evacuated and the rest stayed in town to be encircled with the American troops. But of the total population, a thousand were killed in a few days. Almost all of Bastogne's homes were hit and a quarter of them were destroyed by the 27,000 shells the Germans laid into them. But all through the town today you hear the sound of hammers and saws, for Bastogne is coming back fast. This is true of Belgium generally. Her industrial areas were not badly damaged and she is recovering much more quickly than most European countries. As a result, her attitude toward America is different. She is more independent than the others, considerably more outspoken in her criticism. The Bastognians, to be sure, are lavish in their praise of Americans as fighters. And "Mac-aw-leef" the general. There was a man! They remember how they answered a call to supply bed-sheets as camouflage for the tanks—and how American paratroopers and tankmen were cold and needed blankets. The call went out, and within 10 minutes Bastognians were throwing their bedding at the GI's as if they had vast surpluses. Many of the Belgians went cold for a long time. But the thousand civilians who stayed in town during the siege also remember another kind of beating they took—and not all of it was at the hands of the Germans. One of those who stayed was George Fountaine. He now works in the town hall, on the floor above the police station. During the battle, he was appointed Acting Chief of Police, his main function being to keep 999 other Bastognians under ground. His home was taken as a command post and he likes to show you the machine-gun bullet holes in his dining-room table. Smiling just a little—not much—Fountaine tells two stories, stories the British and French might not recall so readily for American ears. 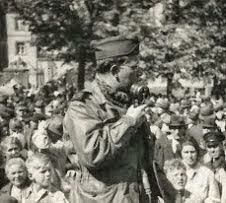 One day, after finishing his civilian patrol, Fountaine came home and found paratroopers looting his house. One of them was making off with his typewriter. He protested. A soldier raised his gun and told him to get the hell out. He got out. When he came back he discovered they had taken not only his typewriter, but also his bicycle and his violin. He put in a claim for 25,000 francs and was allowed 3,000 ($25 or $30). "Which was better," he admits ruefully "than most of us did in our claims against the army." During another patrol of the town, Fountaine saw that a jewelry shop had been broken open. Inside he found a crowd of GI's loading up with rings and bracelets. Again he protested. Two paratroopers took him by the arm, patted him on the back and said, "You're a fine fellow—you're doing a good job. Let's take a walk, George." They walked him around the block, and when they got back the other paratroopers, and the jewelry, were gone. Later Fountaine reported this to the local MP. "Sorry, bub," he was told. "I'm only here to direct traffic." The independence which permits Belgians to make legitimate gripes like these seems also to inspire less worthy postures. Remember how Americans were at one time adopting embattled towns like St. Lô and Isigny? They took it upon themselves to contribute money for food and clothing. In some cases they even had children from the stricken towns brought to the United States to be educated and restored to health. Well, after Bastogne was relieved and the Germans were pushed back, the townspeople said, "Now we are a bit of American history. The Americans will appreciate us and make our town rich." But we never adopted Bastogne. "We are orphans," says Fountaine, "completely abandoned." A friend in his office interrupts. "Not quite," he says. "Some English town—I forget the name—some town in northwest England adopted us." They both looked as if this was something not quite fair. It was like being adopted by a poor uncle just before a rich uncle hears of your plight. They are still hoping Bastogne may be adopted by Americans. In the meantime, they figure that whether or not we take them, maybe they can take us a little. They now look forward to the day when thousands of U.S. tourists will again make pilgrimages to European battlefields. Already they plan to erect a great war memorial which will be inscribed with the names of the 40,000 American soldiers who were casualties in the Ardennes. 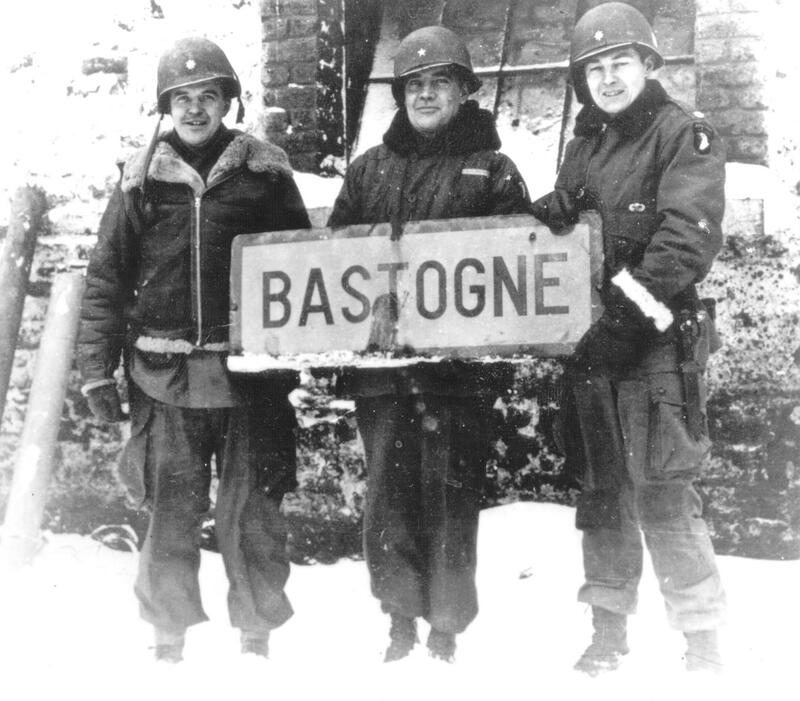 Another plan, not yet approved, is to build a big arch at the entrance of the town, an arch with neon signs, no less, that will flash the arresting words: "Stop—you are entering Bastogne, the 'Nuts!' town."